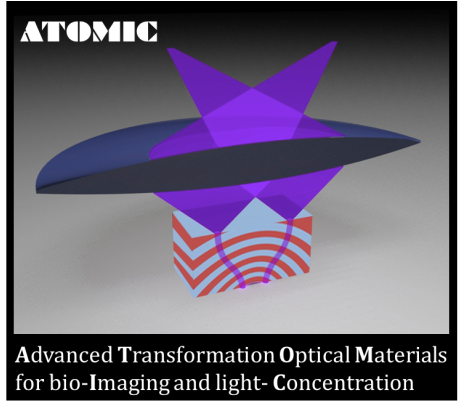 ATOMIC, namely “Advanced Transformation Optical Materials for bio-Imaging and light- Concentration”, is a project aiming at the development of novel compounds and fabrication techniques enabling a new class of artificial materials with unprecedented capabilities for a broad spectrum of possible applications including: i) ultra-resolution imaging (Planar Metamaterial Hyperlenses - PMHs); ii) enhanced energy harvesting (Light Concentrators – LCs); iii) efficient and integrated optical quantum sources; iv) ultra-fast tunable nanophotonic devices. The project has been sponsored by the European commission under the framework of the Marie-Curie fellowship. Up to date, there are 13 peer reviewed publication and 27 contributions to international conferences linked to ATOMIC accounting for over 250 citations (with many invited talks and recorded presentation for outreach purposes).